I’m terribly superstitious. I refuse to say Macbeth inside a theatre, would rather eat my face off than walk under a ladder, and once cried for days over a broken mirror. One of the things I’m superstitious about is flying. Every trip has to be the same. I get there very early (a minimum of 3 hours), buy about 40 magazines, and plop myself directly in front of the gate for the 2.5 hours before boarding. I have a couple rituals on the plane too, but you don’t need to know all those. So I was flying from Chicago to LA after my BFF’s wedding a couple years ago. I, of course, purchased my $737 worth of magazines. One of those magazines was the January 2008 issue of Gourmet, featuring Edna Lewis’ lovely essay, “What is Southern?” I immediately became obsessed with this incredible woman. I have her cookbooks and I’ve stalked her recipes all over the internet. Her buttermilk cookies have been on my list for ages and this past weekend, I had tons of buttermilk and nowhere to go. So I finally made them. These cookies are amazing. 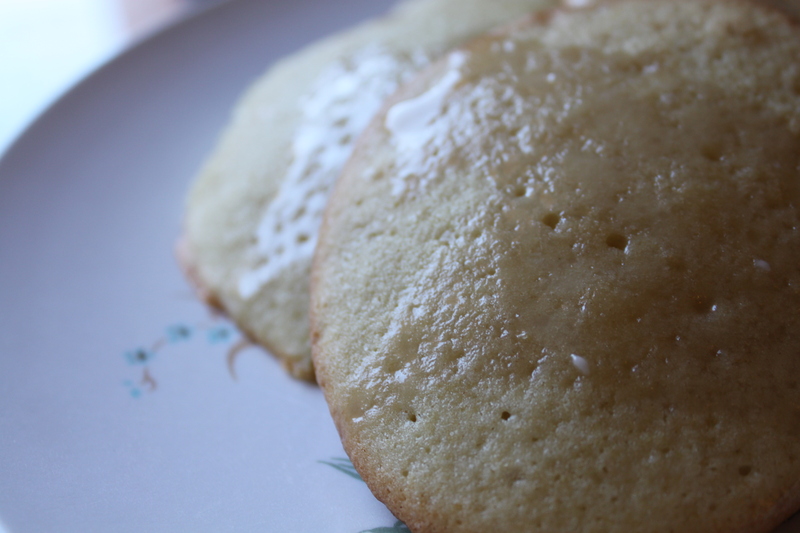 I love them so much, I’ll never make them again because I will never stop eating them. Okay, that’s a lie. I’ll make them forever and ever. 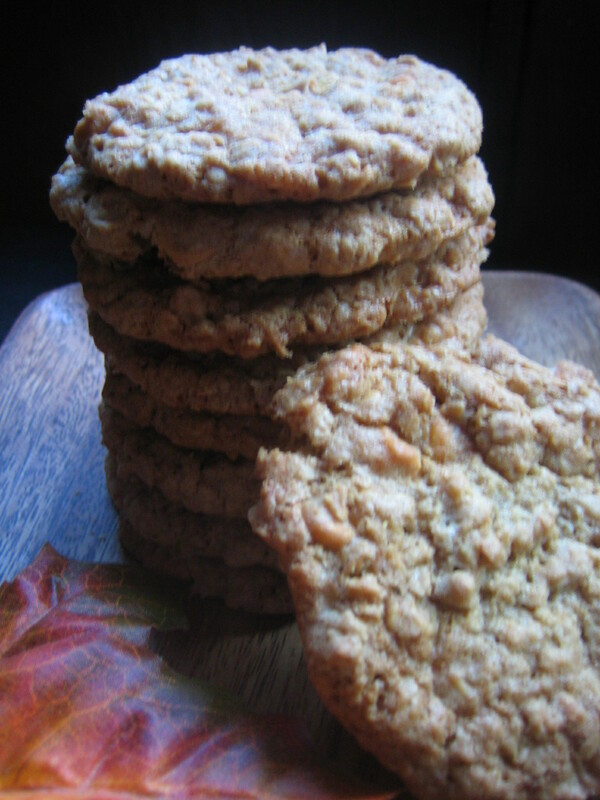 These cookies have a lovely cakelike texture and a fantastic flavor. The glaze adds just a touch of sweetness. Even Mr. Butterpants loved them. And he doesn’t love anything except Reese’s Peanut Butter Eggs and Transformers. The glaze in the photo at the link looks thicker than mine. This is probably because I didn’t measure my buttermilk so mine came out a little thin. I loved the glaze, but I’d probably want it thicker next time. Preheat your oven to 350 degrees with your rack in the middle. Grease 2 large baking sheets. I used my silpat and had a bit of trouble with sticking. I’ll trying greased parchment next time. Whisk together flour, zest, baking soda, and salt. Set aside. Cream the butter and sugar in a large bowl with an electric mixer until pale and fluffy. Add your eggs one at a time, letting each one completely incorporate, then beat in the vanilla. Mix in your flour mixture and the buttermilk alternately in batches at low speed, beginning and ending with flour, until smooth. Drop the dough about 1 1/2 inches apart onto baking sheets. Gourmet recommends a level tablespoon, I didn’t level, just dropped what looked to be a tablespoon or so on the sheet. Bake, one sheet at a time, until the cookies are puffed and the edges are slightly brown, 12 to 14 minutes per batch. Cool cookies on sheets for one minute, then transfer them to a wire rack to cool. While the cookies are baking, whisk together your confectioners’ sugar, vanilla and buttermilk until smooth. 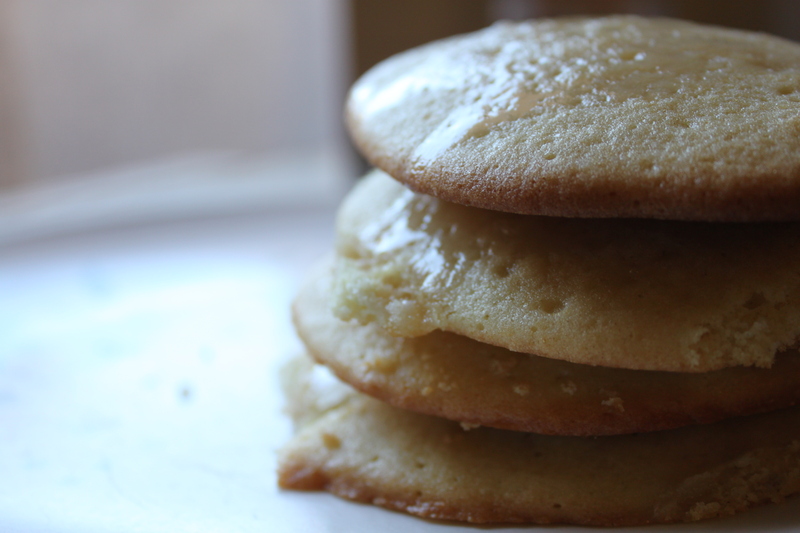 Brush onto the tops of your still-warm cookies. Let them stand until the cookies are completely cooled and glaze is set. Make them. Make them now. My birthday was last month. I turned a number I’m not going to share. This is because I’m in the entertainment business. And vain. I am at an age where I think it’s a little ridiculous to have big blowouts, but I still believe that the entire month of February is my own personal holiday. So I had a small dinner with my closest girlfriends at my favorite Mexican place in Los Angeles, Gloria’s. Side note about Gloria’s: their food is excellent, the service is fabulous and we eat there so often they know our order and our names. I love it. Check it out if you’re in the area. You might even get served by Gloria herself. Back to me. I’ve been possessed by the idea of a giant hostess cupcake birthday cake for a while. It just kept popping into my brain and floating there like a beautiful butterfly. A beautiful ganache covered butterfly. This one was pretty awesome. I found the buttercream a little sweet, so I’d probably go with the marshmallow frosting I’ve seen other places. Anyway, here you go. Make it for an upcoming birthday. Or Easter. Or Tuesday. 3. 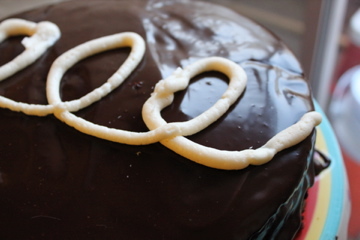 Bake for 30 to 35 minutes, or until a cake tester or wooden toothpick inserted in the center comes out almost clean. Let cool in the pans for about 20 minutes. Invert onto wire racks, carefully peel off the paper liners, and let cool completely. At this point, I carved out a bit of the center and filled it with the buttercream frosting. I don’t know if I’d do this again because it turned out to be a quite a big blob of frosting. But it’s what I did and I feel I must share that with you. Keep a little of the frosting for the swirly design that goes on top of the cake. 4. 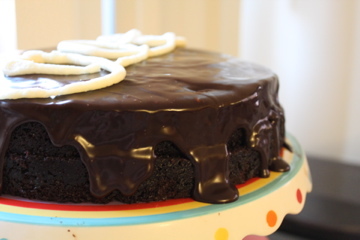 When the cake is cool, top with the ganache. Pour it into the center then spread so it’s dripping down the side a bit. Let it solidify in the fridge for a minimum of 1 hour. 5. Put the saved buttercream frosting into a pastry bag or zipper bag and make your swirl across the center of the cake. 6. Shovel it into your face and the face of others in copious amounts. 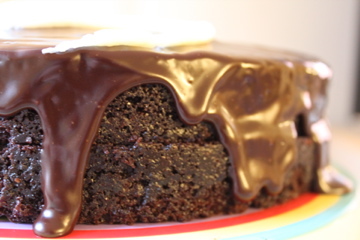 I can’t find the ganache recipe I used anymore, but I offer this one. It looks pretty much like what I did. Cream shortening and butter until smooth. Add vanilla. Slowly add your sugar, while beating thoroughly on medium speed. Add milk and continue to beat until light and fluffy. So a couple months ago, I was complaining about much I missed New York and trying to figure out a way to get there for a visit. Lo and behold, JetBlue answered my call. A little email about cheap flights appeared in my inbox. Off I went. This isn’t much of a travel blog- I was sort of there to reconnect with friends and enjoy the city, but I’ll hit a few highlights. A beautiful production at the Barrow Street Theatre. I love this play, I’ll never not cry at the line, “Do any human beings ever realize life while they live it?—every, every minute?” But this production made me feel as if I’d seen it for the first time. I heard lines I’d never heard before. The simplicity of the set (almost nothing), costumes (it appeared as though the actors just walked on in their street clothes), and performance created an entirely different experience for me. I bought this ticket immediately after booking my flight. I love Sarah Ruhl and I’ve been a fan of Michael Cerveris since I saw The Who’s Tommy on Broadway at the age of 15. He was so nice to 15 year old me, it made me a fan for life. But he’s not just a nice guy, he’s a fantastic actor. His performance in this play was heartbreaking and beautiful. Quincy Tyler Bernstine and Maria Dizzia were also standouts. Unfortunately, this beautiful play closed the day after I saw it, but if a theatre company does it near you, go. My favorite stop was Mother Butter’s house. We sat, had soup, and talked for a long while. It always amazes me how great friends can pick up right where you left off, no matter how long it’s been. Mother Butter and I have been friends, roommates (an experience that should never be repeated), colleagues… she is one of my nearest and dearest. It was so lovely to catch up with her in person. And her soup was excellent, I hope it makes an appearance here. I always intend to get something other than latkes and blintzes here, but it never happens. Mr. B likes the brisket, extra lean with pickles. One of my favorite brunch places. We used to live around the corner and dropped in most Sundays. This has become a tradition with some friends I met years ago on a trip to Poland and Israel. We usually order one of everything and devour every bit of it. I don’t know why anyone would order anything but the blueberry pancakes here. I’ve had their biscuits, they were sort of “meh” for me. But those pancakes…… oh man. 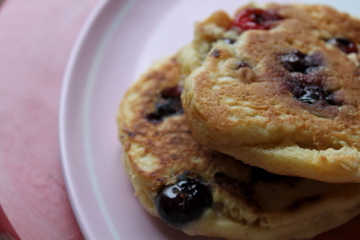 They’re soft and full of juicy blueberries. And the maple butter syrup thing they serve with it? Heaven on a plate. I recommend a visit on a weekday, if you can. The lines are crazy on a weekend. Which brings me to today’s recipe…. I don’t normally eat pancakes, but Mr. B loves them and Clinton Street had started me down a terrible path of carbohydrate cravings. I googled for a recipe and came up with this one from Let Her Bake Cake. I used her recipe as inspiration and tossed a few cranberries in as well and added some vanilla, because why not? Mix flour, salt, sugar, baking powder, baking soda in a bowl. Set aside. Separate the eggs. Yolks in a large bowl, white in a mixing bowl. You’re going to whip the egg whites to soft peaks. Add the buttermilk, butter, and vanilla in the bowl with the yolks. Beat together. When it’s all mixed, add in the dry ingredients. Whisk together. Some lumps are okay. Fold in the egg whites to your mixture. When they’re completely incorporated, drop the batter onto a buttered griddle and cook over medium high heat. When the batter starts to bubble, it’s time to flip it. 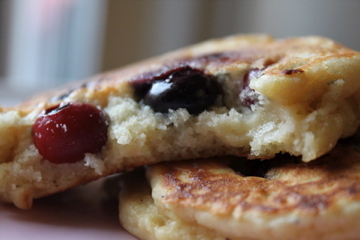 Drop a few blueberries into the batter, then flip. Cook until golden brown. Serve immediately with a topping of your choice. I loved these- thick, but not dry. Moist and fluffy. A great base for other things- chocolate chips, fruits, whatever you got. I’d probably add a little more vanilla or some sort of flavor to give them a little kick. This recipe is here to stay. Happy Dr. Martin Luther King, Jr. Day. Warning- no photos is this post. The food went too quickly to be photographed. Someday, I’ll add one. I spent this past Saturday with old and new friends. My friend M from college was in the LA area and we had lunch at Jin Patisserie. By the by, I recommend the Banana Mascarpone Cake. Highly. I hear they have amazing macarons, though I haven’t had occasion to try them. M and I caught up with each others’ lives and reflected on the fact that it has been 12 years (!) since we met. Hold on, I’m crying. M was one of the first people I met at college. He is and was a total sweetheart. I remember that we bonded over speaking French and Boone’s Farm at the department’s Getting to Know You Party. We graduated from a tiny theatre department. Several of us lived in a house together (RIP Pflug and Harmon). Aside from the normal drama of a tiny theatre department, our crew had a rough go of it. Lots of changes and painful losses. We fought and yelled and snarked at each other, but there was a fair amount of support and love, when we weren’t in the middle of auditions. We also did a lot of holding back of hair after particularly rough nights. That will bond you for life. I have tremendous love for each of them. Even if we weren’t besties in school, every time I see them, I feel like I’m seeing my family. We’ve all grown up and realized that that part in the mainstage show really has no bearing on our actual lives so the snark and tension is gone and there’s just this shared experience of growing up together. And I’m so thrilled that so many are making amazing careers and lives for themselves, in and out of the theatre. I had to leave M after a lovely chat and walk on Venice Beach (I only take my friends to the nicest places!) because we were having new friends over for dinner. I met ActorFriend a few months ago when we were randomly paired as scene partners for an acting class. In our first rehearsal, we bonded over being East Coast theatre actors in the strange land of LA. After Mr. B and I enjoyed a lovely dinner at the home of ActorFriend and his supercool wife, I invited them to dinner at our place. They brought their adorable, hilarious daughter, who at one point in the meal leaned over to her dad to say, “Daddy, can you talk to the nice nice nice girl (me) so I can talk to Mr. Butterpants?” We’re still not sure who she wanted Mrs. ActorFriend to talk to, but I’m not sure she cared as long as it wasn’t Mr. Butterpants. She is way more into him than me. It’s all good. I’m always afraid to talk to children- curse words fly out of my mouth really easily and then I’ve ruined a childhood. I love cooking and I love having people over and feeding them until they pop. That said, I always have a bit of a complex about cooking for new people. Especially when the new people are good cooks. We’d already really enjoyed ActorFriend’s chili and Mrs. ActorFriend brought over what turned out be excellent chocolate bread pudding. And by the way, I ran out of turnip greens. Not embarrassing. Not at all. Ugh. So I went with something I knew was easy, not too over the top and previously successful. Red Beans and Rice. We called my husband’s dad to get some tips, but as with any good Cajun cook, he doesn’t have a recipe. So he gave me some tips and I ended up just flying by the seat of my pants. I think it was successful. The exceptionally critical Mr. Butterpants even ate the leftovers. It’s a good sign, trust me. I used this recipe from FatFree Vegan Kitchen as inspiration. The first time I made it, I stuck pretty close to this, but this time I was serving to meat eaters so I used the sausage. And I’ve fallen off the vegetarian wagon as of late. Back on now, though! Put your beans in a large dutch oven or pot. Cover them with water- about 2-3 inches above the beans. Soak overnight. Again, cover the beans with water about 2-3 inches above beans. Simmer over medium heat. In a saute pan, melt your butter over medium heat. Saute your onions, celery, bell pepper and garlic until soft. Add your spices (start off slow with the Slap Ya Mama/cayenne, you can always add more later). Stir for a couple minutes, then add to your beans. While that’s all getting loved up together, slice your sausage and brown it in a skillet. Once it’s browned, toss it into your red beans mixture and cook over medium-low heat. This has taken me anywhere from 3-6 hours depending on the beans. You want the beans to fall apart and it’ll look a bit like a mash. You don’t want it to become a paste though, so if it starts to look like that add a bit of water. Then add your salt, pepper and any additional spice you might want. I like to go light on the spice because you never know what people can tolerate. Mr. Butterpants can eat fire (it’s in the Cajun genetic code), but I knew that we were serving a kid. Know your audience is all I’m saying. I used Uncle Ben’s Instant Rice because I’m lazy like that. I managed not to screw it up, though it was touch and go for a moment. Serve to a fun crew with something green, crusty bread, and lots of wine. Happy, merry, and all that goodness. Italy is my second favorite place on Earth. New York wins first prize, in case you were wondering. My parents lived there before I was even a zygote. We all lived there for a bit while I was a toddler. My father spent quite a while there on a Fulbright scholarship. Imagine my father as a really really smart Bluto (Animal House) to get the full picture. There is a tape of me at the age of two having a conversation with my grandfather. I have a spectacularly heavy Southern accent and then suddenly I start speaking in perfect Italian. It was impressive for a three year old. Despite living there for a time and my perfect Italian, I remember almost nothing. I have only a memory of a carousel and of my Mickey Mouse sheets. Otherwise, nothing. I spent my entire life hearing about how amazing Italy was. How gorgeous it is. How incredible the food is. One of my friends in high school went back to visit her family every summer and I burned with jealousy. Probably because she got to go to Gaeta. From her, I pretty much heard how hot the guys were. We were 16. It’s really all that mattered at the time. I finally got to go back after I was married to Mr. Butterpants. We went on a belated honeymoon and spent time in Rome, Florence, and Positano. Heaven. Heaven. I have a postcard my Dad sent me from Italy when I was a kid. 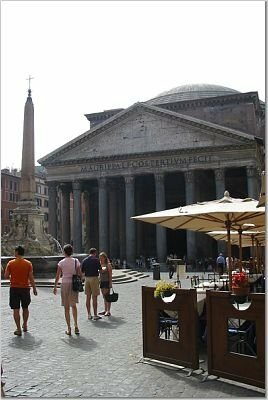 It’s a picture of a cafe in the piazza in front of Pantheon. When my husband and I went, I took a photo to recreate the postcard. I’m not going to lie. I cried. I was so happy to be there. I was so happy to be in a space that I had stared at for so long. I was happy to be in a place that meant so much to my parents. It felt both unfamiliar and like I was finally home. While we were in Italy, I ate Caprese salad, pomodoro sauce over whatever pasta was closest to my mouth, Paglie e Fieno, and gelato. Look, I’m a simple girl. I have simple needs. These foods are spectacular in their simplicity. One day in Florence, we were ready for our seventh gelato of the day (I think it was 10 am) and stopped off at a gelateria. There was an osteria right next door so we decided to balance out the sugar with some… potatoes. Potatoes and onions. Potatoes and onions are on my list of the top five foods I could eat every day and never get sick of. Recently, I was missing Italy a bit. I kept flashing on those potatoes. So I made some. Man, did they hit the spot. It’s amazing how food can transport you. I was immediately back in that little osteria in Florence, a bright-eyed, bushy-tailed newlywed on my honeymoon. Lovely. These are great breakfast potatoes, a side dish, dessert. Whatever you need. In a large frying pan, melt the butter over medium heat. I had to use a wok because I had a crapload of potatoes. Dump your sliced potatoes and onions in your pan. Fry for 10 minutes, stirring occasionally so the potatoes don’t stick together. Dump in your garlic, salt, and pepper. 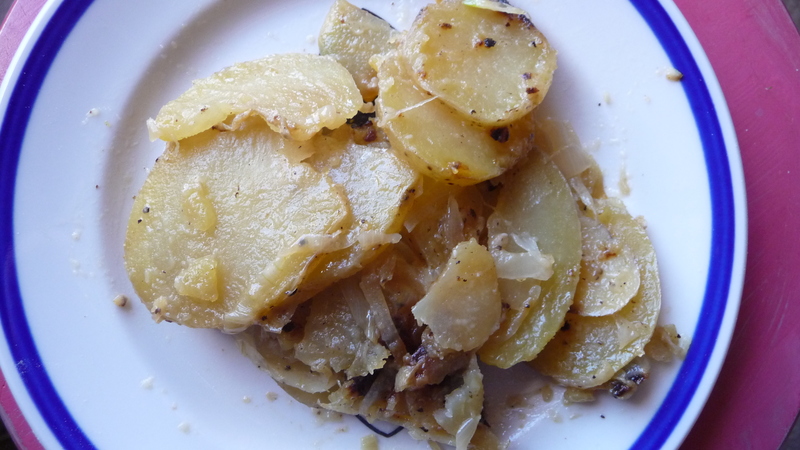 Continue stirring and frying until your potatoes and onions are tender and slightly browned. Eat. Here's what they look like on a plate. Mr. Butterpants is obsessed with cheese and potatoes, so he added cheddar to his. He really liked that. So you could do that, if you’re into that sort of thing. This is a very special edition of The Buttery Blog, and I am so excited to introduce Just Baked Brooklyn to everyone! I recently met up with Heather Lattuca Ferrari, the owner of Just Baked Brooklyn, at a cafe in the West Village. I asked her if she would talk about her new business, which is a year in the making, but just a few months in full swing! She happily accepted my offer, and brought some delicious samples with her. Over a lunch of savory crepes, we dished about food, life, and dogs. Heather bakes up sweet treats for people and pooches. The company’s motto is “Life is Sweet. Give a dog a treat.” …and why not give yourself a treat as well! She already has two business clients that have weekly orders. What inspired you to create people and dog treats? I have always loved making cookies for friends and family. When I moved to New York, people would hire me once in awhile to make a cheesecake or a bread or cookies. I grew up in a restaurant family. One of my parents’ first businesses was Just Baked, which was a seasonal (summer) pastry shop in Watch Hill, RI. When I married my husband, a trained chef, I knew the journey would continue. Our inspiration for The Odie Collection (our dog treats) is our dog Odie. We adopted him in November 2008 and fell in love! He is my first dog and I never knew how much I could love an animal. He is not always interested in food so I try and make treats that he likes. 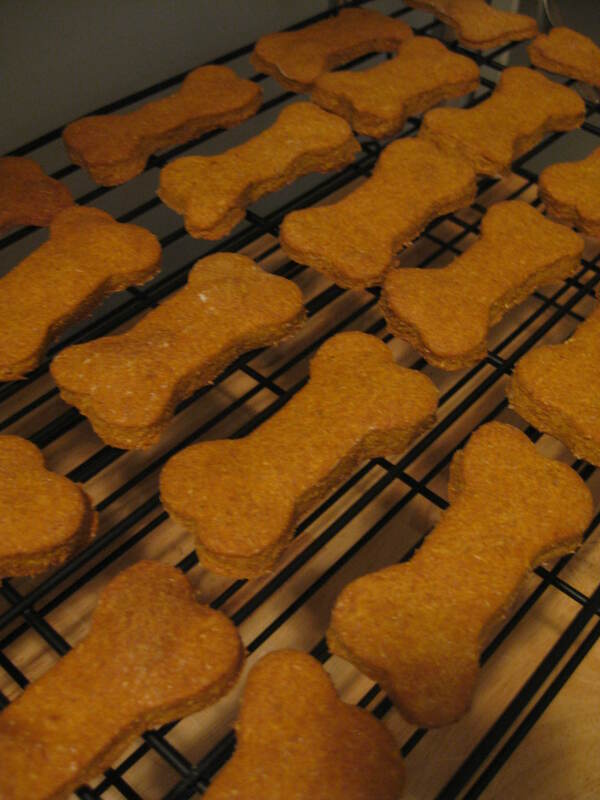 Making dog treats is so much fun! Did you have to do any special research to create the dog treats? Yes! Dogs are highly allergic to some very common baking ingredients, like chocolate. I researched what types of foods are good for dogs (pumpkin, oats, apples, turkey, beef) as well as the flavors they generally love (peanut butter, cheese, bacon). I was important to me to have a good combination of both. 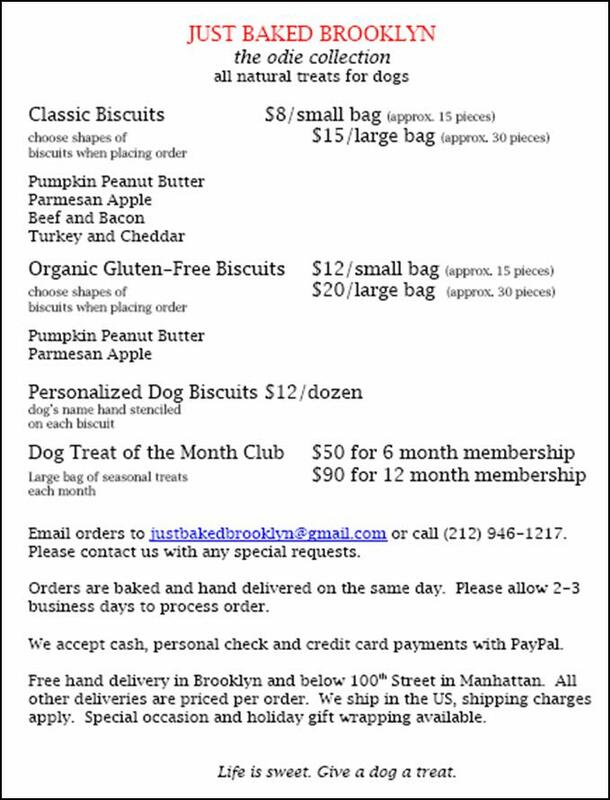 Many dogs are allergic to gluten, so we have gluten free treats as well. What is the favorite cookie on your menu? The Chocolate Toffee Sea Salt cookie! My all time favorite bakery was Just Baked. I love Henion Bakery in Amherst, MA. In New York, I would have to say Amy’s Bread. How long had you been thinking about creating your own business until you finally took action? A couple of years. 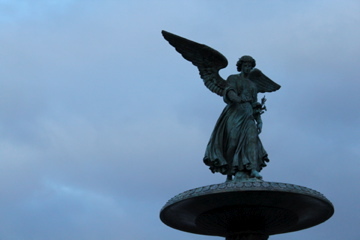 I moved to New York almost 8 years ago to pursue my acting/singing career. Before I started seriously thinking about Just Baked Brooklyn, I wanted to see if there was a way to do both. I am starting off at a slower pace with Just Baked Brooklyn so I can learn to truly balance both my acting career and baking business. Many- my mom and dad, my husband, Julia Child, Cesar Millan. What advice would you give to someone who is thinking about starting their own catering or baking business? The food business requires a lot of time and hard work, so you need to love it! You need to enjoy making people happy. Keep it simple and delicious. If you’re interested in learning more about Just Baked Brooklyn, become a fan on Facebook (http://www.facebook.com/justbakedbrooklyn). 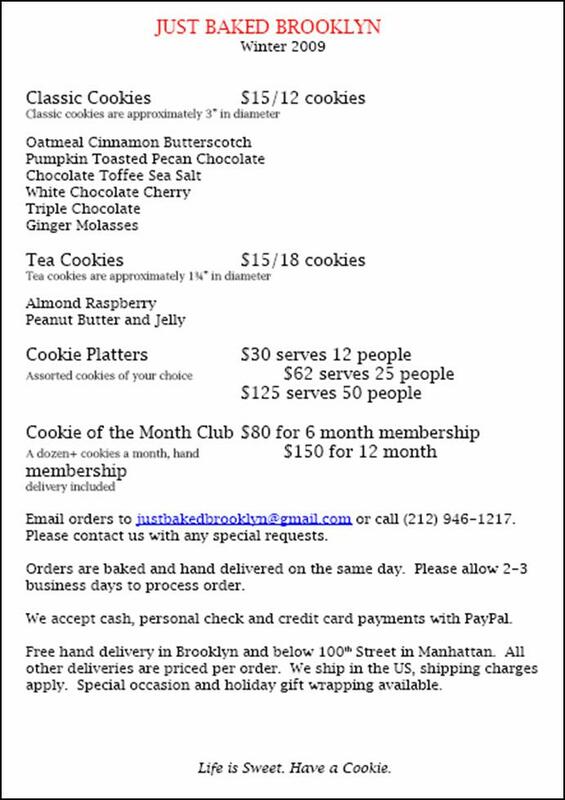 For orders, email your request to justbakedbrooklyn@gmail.com. For The Buttery Blog readers, just mention “Buttery Blog” and get free shipping on one order until December 31, 2009. The joys in my life are simple. One of the things I love to do is make food for someone that they have never tried. As you might imagine, in New York City that is quite hard to do. People here eat food from all over the world. Today was the Thanksgiving meal at Butter Boy’s class. We were supposed to bring in food from our own cultural background. It was the perfect storm for me. I could make some true Southern food that a lot of these New Yorkers had never tried. Yes! The dish- cheese grits. I bought grits- real grits- this summer when I was in North Carolina. I have yet to come across grits here that are not instant and awful. This recipe doesn’t specify what kind of grits you need to use so let me specify for you. You need real grits, not Quaker instant grits from the super market. I use Daniel Boone grits which worked great. The recipe that I used is from Paula Deen, of course! It was a big hit. I think you should try it! 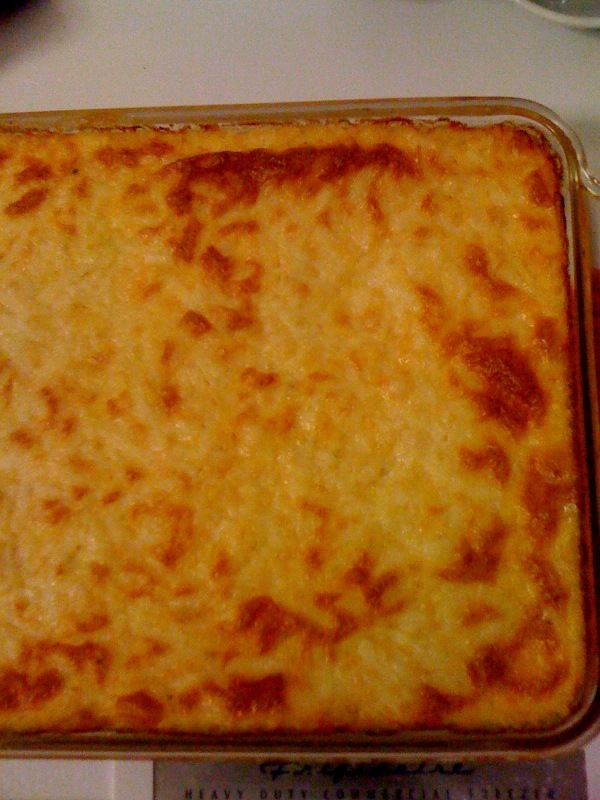 Preheat the oven to 350 degrees F. Grease a 4-quart casserole dish. Bring the broth, salt, pepper, and garlic powder to a boil in a 2-quart saucepan. Stir in the grits and whisk until completely combined. 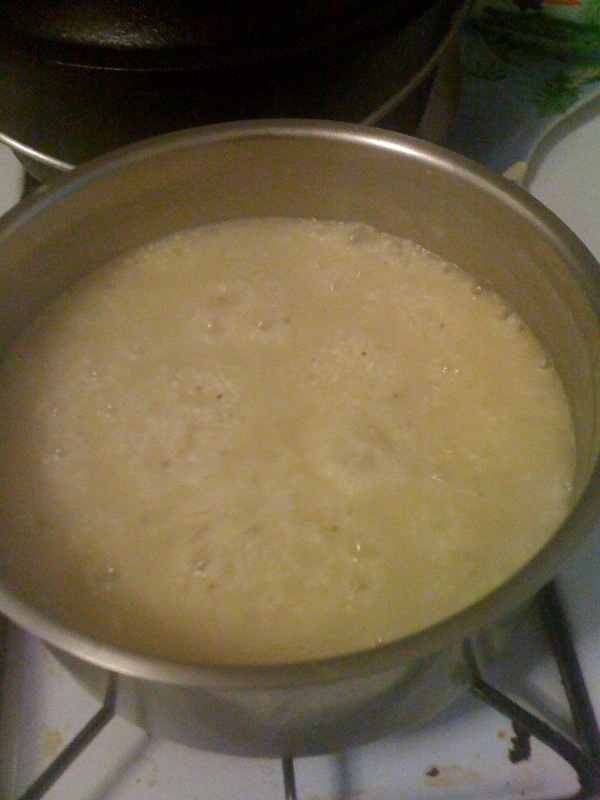 Reduce the heat to low and simmer until the grits are thick, about 8 to 10 minutes. Add the cubed Cheddar and milk and stir. Gradually stir in the eggs and butter, stirring until all are combined. Pour the mixture into the prepared casserole dish. Sprinkle with the white Cheddar and bake for 35 to 40 minutes or until set.